oje, was soll das denn? I think it's not bad at all, quite nice in fact. Sudden style change for the Westlife lads after Bri(y)an's departure. Back to the 1940s with a Big Band approach. Could work quite well. What an appropriate title. May I kick you in the head? Great song. Allright a cover, but a good cover. Das Lied mag ich nicht. Ansonsten gut gesungen. Westlife are the worst act ever for releasing boring no thought cover versions. To the point it was past a joke. The majority of all their singles released are cover versions...lazy. Aardig gedaan maar geef mij de cover van Robbie Williams maar. it ain't a kick for me! 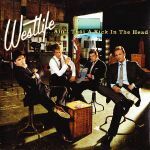 ▒ Zwakke, overbodige "jazzy" cover door "Westlife" uit november 2004 (Holland) !!! Strande ook terrecht op # 12 in de NL Tip 30, begin december 2004 ☺!! !